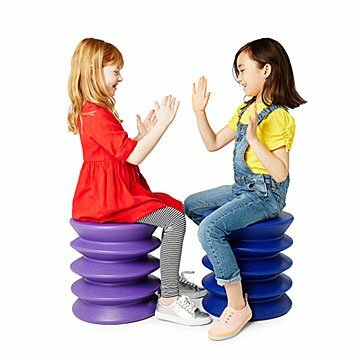 This "active sitting" stool helps kids stay focused and build good posture when they have to stay put. Anyone who's spent more than 30 seconds with a child knows that holding still isn't usually their favorite activity. But sometimes kids do need to stay put—homework, coloring, puzzle time. This colorful accordion-style perch makes those moments more comfortable by encouraging "active sitting." It compresses slightly when kids sit, letting them bounce just enough to burn off a bit of energy. By allowing movement while seated, the stool may support concentration, improve posture, and decrease stress. (Yep, littles get stressed out, too.) It's so fun, you'll want your own. Made from recyclable material in Fairfield, Iowa.